The score of an old missionary mass in the country was written between 1730 and 1740. The musical score of an old missionary mass written between 1730 and 1740 and sheltered for more than three centuries by the inhabitants of the Chiquitania, in the east of the country, has been immortalized in an investigation carried out by the Polish priest Piotr Nawrot. Missa III Mo Fiesta Purificación is the title of the book with the results of Nawrot’s research on homonymous composition, according to a statement released yesterday by the Asociación Pro Arte y Cultura (APAC). The association presented this week the publication in the municipality of San Ignacio de Velasco, in the department of Santa Cruz. The composition of an anonymous author, but attributed to the Swiss priest Martin Schmid, is one of the almost 40 polyphonic masses of the music collection of the Jesuit missions. “This is the oldest missionary manuscript in the world,” remarked Nawrot, quoted in the statement. Schmid was one of those sent by the Society of Jesus to work in the evangelization missions established in the Chiquitania, in which the architect and musician also made his work evident in temples built in the area and some musical compositions, according to the same source. .
Nawrot, based in Bolivia, is the artistic director of the international Renaissance and Baroque music festivals Misiones de Chiquitos organized by APAC more than 20 years ago. The research on the Mass III Mo Fiesta Purification was possible with the financial support of the Embassy of Switzerland in Bolivia, through its Cultural Fund, and had the support of Solidar Switzerland, AOS Swiss Workers Aid, in the execution. 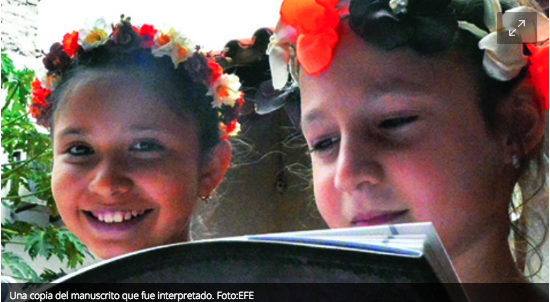 The Swiss support reached the priest Nawrot’s research, the edition and publication of the book, which is distributed free of charge by APAC and also came to the Choir and the Children and Youth Orchestra of San Ignacio de Velasco.